Choose from a wide selection of Customized Shot Glasses imprinted with any design and message your choose. 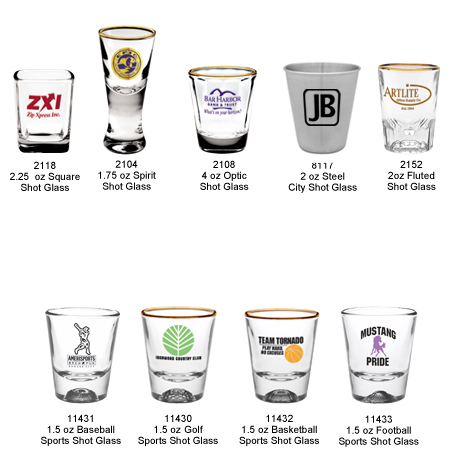 We offer Stainless Steel Custom Imprinted Shot Glasses, Square Custom Shot Glasses, Sports Theme Shot Glasses, Jumbo 4 Ounce Customized Shot Glasses, and more! 2118 2.25 oz Square Shot Glass 2.86 2.61 2.49 2.37 2.26 2.15 1-1/4" 7/8"
2104 1.75 oz Spirit Shot Glass 4.02 3.76 3.58 3.41 3.24 3.08 1-7/16" 1-3/8"
2108 2 oz Optic Shot Glass 3.29 3.04 2.87 2.75 2.61 2.48 1-1/8" 1-1/2"
8117 2 oz Steel City Shot Glass 3.84 3.59 3.40 3.24 3.08 2.94 1-1/4" 1-1/2"
2152 2 oz Fluted Shot Glass 3.59 3.34 3.16 3.01 2.86 2.73 1-1/4" 1-15/16"